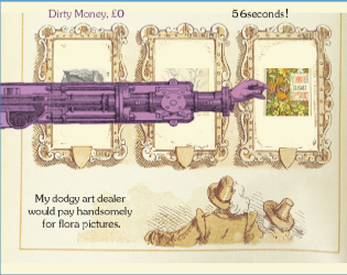 A work in progress created for the British Library #bl_labs game jam - unsubmitted, as I didn't finish in time. Click on the best matches for the art buyers request and make as much dirty money from pilfered art as you can in 60 seconds. Or click on "Next deal" if none of the art works match the buyers request. NB: It takes a while to load (a minute or so), as it's pulling in a lot of live images from the web. The game also generates a file of untagged images indicating the % accuracy of the tag the player chose for them in the game. Click to move on from the game over screen. Most of the artwork is adapted from The British Library digitised images collection.